The Optimum G2.1 Platinum Series blender comes with a host of advancements from Optimum for £599. Featuring a touch display and an entirely new design, including the jar, it's pitched as the most advanced blender Optimum have ever released, and we’ve been heading it against the best from Blendtec to see. This is unquestionably the most well thought out product we’ve had in the studio from Optimum. The fresh-faced cleanness of the all stainless steel Optimum G2.1 Platinum Series blender strikes out on our kitchen worktop as a statement piece. The straight lines, curved corners, wrap-around black surface and chrome edging, are all details which Optimum haven't paid such meticulous observation to previously and we appreciate it now! We even like the way the 2L 6-blade jar contours with the square metal base, which is available in black, silver or red - we have the latter colour and it alters its shade subtly as the sun fades. The overall appearance leans on being one of the most attractive blenders we’ve had in the studio. Practicality hasn't been lost in this new sophisticated image, though: the power cable is a generous 1.5 metres long and rubber feet stop this blender from fidgeting under stressful tasks, plus the 5.5kg base will neatly pack into a cupboard or under a worktop; although the total height with jar might not be too tall to sit proudly underneath cupboards placed a little higher than ours. The interface is incredibly easy to use, and once you go touch screen it’s hard to look back, as we’ve discovered with kitchen appliances from both Melitta and Blendtec. One reason for this is because it’s a lot cleaner: Let's face it, hands get dirty when cooking and baking - and usually some of that ends up on the dials and buttons. Here we have a flat slab digital touch display that needs only a single wiping down after use. However, this isn't the best thing about this style of input, because it’s quicker to navigate, too. All usual functionality is present, like start/stop, a timer, pulse mode, manual 8 speed setting - and then there’s the menu. Here we have 6 preset blending automatic programmes with algorithmic usage of speeds for best results of the produce they intend to blend. There are modes for smoothies, sorbets, nut milks, soups, sauces & grinding. Interesting side notes to mention before we reveal how well it blended the eclectic mix of produce highlighted below, begin with the fact that the tamper tool has remained in the box, we haven't needed to reach for it once - other than to take its photo. Another thing is that this blender does a good job at cleaning itself due to the inbuilt algorithms in its saved modes. A minuscule squirt of washing up liquid and a litre of hot water is very effective at completely cleaning wet produce from the sides and under the blade area. Obviously drier mixes like doughs will need some scrubbing and the lid usually needs a bit more of an intricate clean too. Lastly, every recipe is from the supplied recipe book - which is a collection from various bloggers. Vegan Raw Chocolate & Coconut Rough: The simplicity of this recipe was admired by us and it’s now a favourite in the studio. 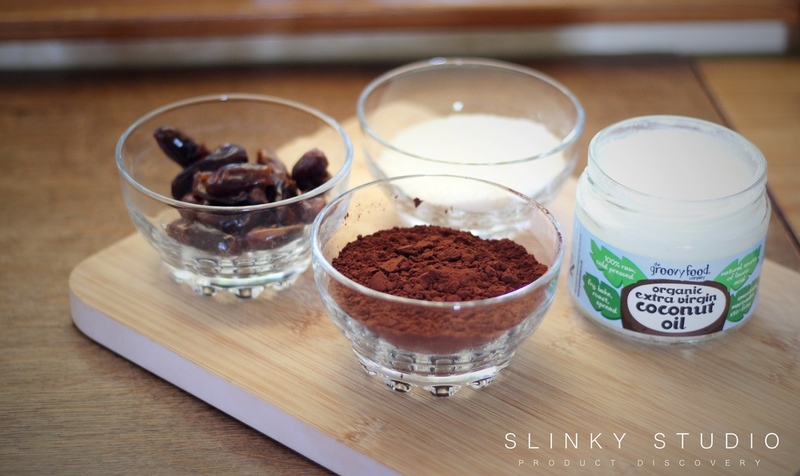 Made with only ½ cup dry pitted dates, ½ cup cacao, ½ cup coconut oil and ½ cup shredded coconut. This all-in-one recipe is blitzed in the Optimum G2.1 Platinum Series for 10-12 seconds, it's poured into a dish, popped into the freezer for half an hour and then it's ready for cutting into squares. 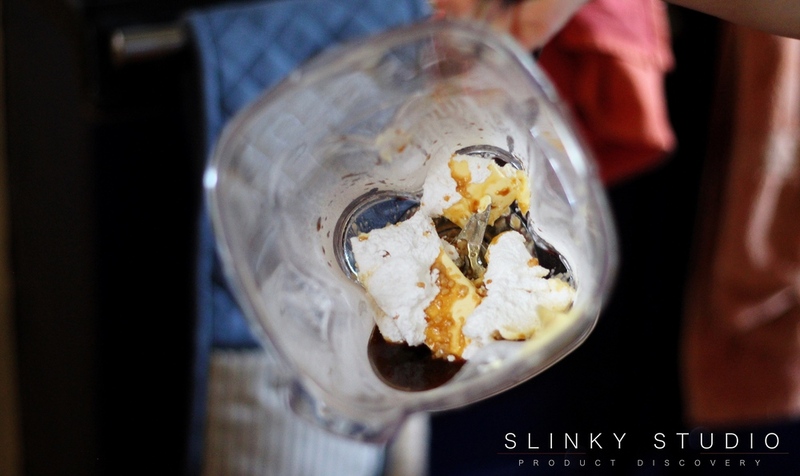 The proof was certainly in the eating, and the blender incorporated all of the ingredients evenly, proved by the consistency of the shredded coconut - which did surprise us because of the minute quantity of mixture within the jar. It’s hard to believe there’s no dairy or added sugar in these raw roughs which divinely melt-in-the-mouth and taste richly exquisite! The addition of mint lends them as an after dinner soother too. 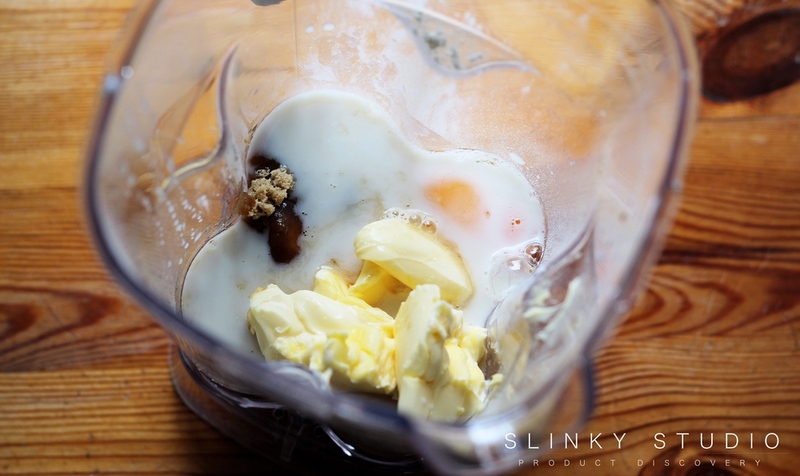 Pancakes: This is one of the things we most commonly make in our blenders. After pressing the smoothie button we sat back and allowed 450ml almond milk, 150g soft brown sugar (or 8g pure stevia), 2 free-range eggs, 1 tsp vegetable oil, 2 cups plain four and 1½ tbs baking powder to mix together for a minute. With pancake mix it’s important to lock air in for a fluffy texture and the Optimum did just this. There was no sunken left over flour to be seen at the bottom of the jar and the pancakes did indeed have a light and fluffy texture. The spout on the jar made pouring directly into a frying pan a clean and easy process, too. 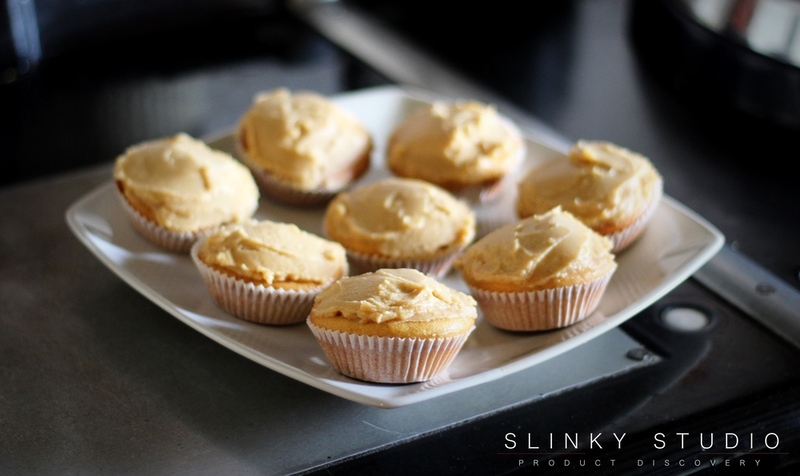 Vanilla Cupcakes with Cappuccino Icing: Cupcake batter shouldn't be over mixed and so we left the blender running on sorbet mode for 20-25 seconds. This may sound like a lesser time in contrast with a stand mixer, but from experience we have previously over-mixed and they haven't risen. 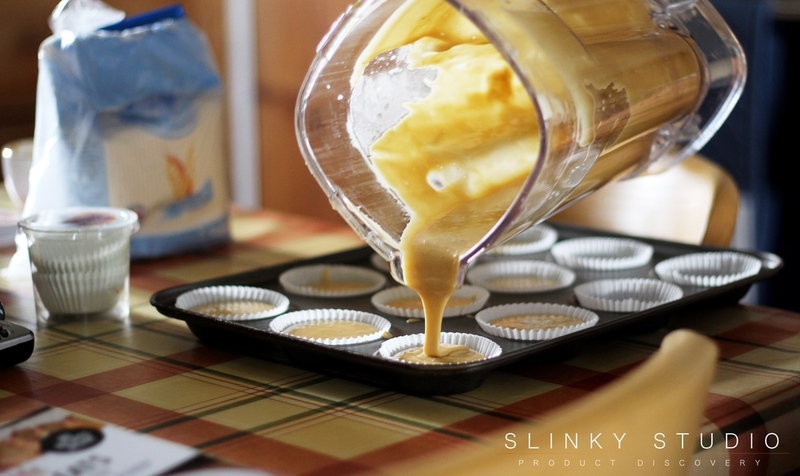 The algorithmic approach of throwing the baking margarine, flour etc., into the air with the intention to scatter and distribute ingredients does indeed work for such a delicate mixture. The cappuccino icing was smooth - although because we were trying to make dense icing in a small quantity, to compensate for inevitable heating from the blade's friction, we did need to scrape the sides of the jar whilst blending as the mixture was so sticky. All-in-all the cupcakes rose and were weightless in the mouth and the vanilla extract integrated uniformly. Caramel Smoothie: Frozen bananas can be a hindrance for blender jar designs and, of course, blending these reveals if there’s a weakness in motor performance. So this smoothie made with 6 dates (stones removed), ½ cup coconut milk, ½ tsp vanilla extract, 1 cup of ice and 1 frozen banana - was a good stress tester. After selecting the smoothie preset we didn't even hear the†motor quibble with the rock solid banana as it whipped it to a pulp.The Blendtec Designer 725, which also has a touch display, does stutter a little, but does always successfully finish. 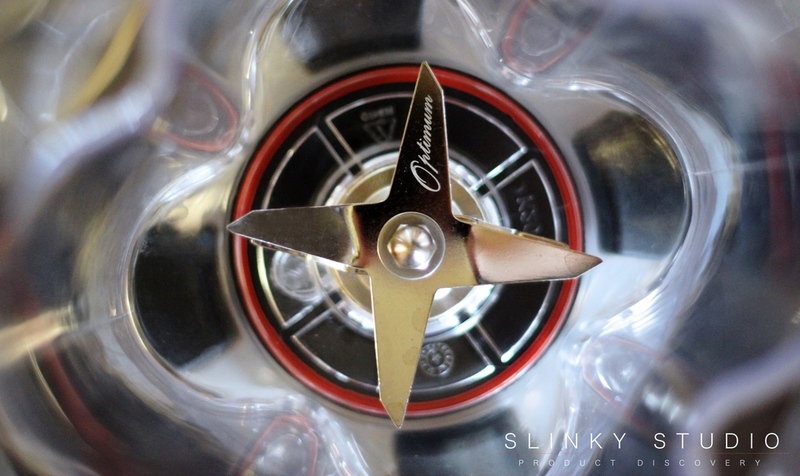 The Optimum is a six blade design, an interesting contrast to the Blendtec 2 blunt blade system. The latter has been ramping through everything we throw at it for years of regular usage, but this particular test was a clear indicator of the Optimum’s mighty 2,611 watt motor versus the still very powerful Blendtec’s 1,725 watts. Vegetable Soup: We used the leftovers of this homemade soup to test the soup (sauces too) mode functionality of the blender. Basically it spins for such a long time and at such speed that the friction heats the soup. Beware, it's not just lukewarm, and left for the full duration of the mode, the soup will need blowing on to cool it down before entering the mouth. However, it should be noted that soups like this are very fibre-rich and will therefore go gloopy if left unaltered, instead additional liquid is needed to create an enjoyable soup of the appropriate consistency. Another aspect of this is that the metal gears and coupling haven't shredded or worn at all from such vigorous blending. 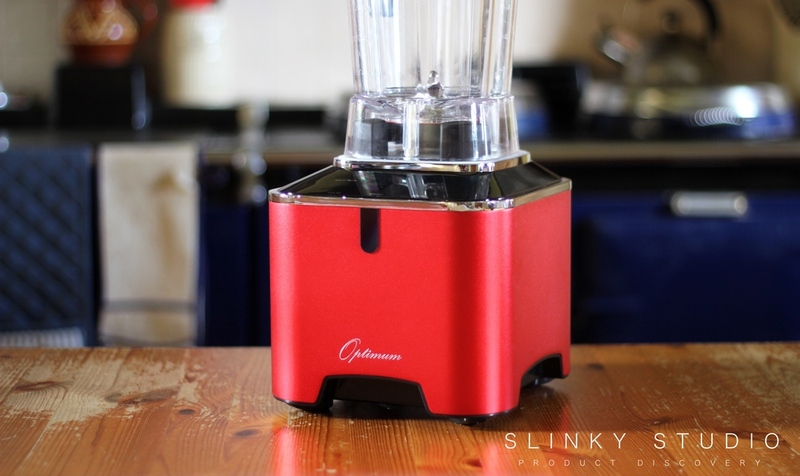 A simple uncluttered touch interface is for many the unique selling point of the Optimum G2.1 Platinum Series blender. Whilst this is a cutting-edge, effective and clean control input, the new sleek base design and jar, that from our experience resists the need for a tamper, are also important innovations. Furthermore, the powerful 2,611 watt motor, when coupled with that new jar design, works powerfully for you - creating a blender equipped for every task you put in it. This blender is thus destined for regular use at home or even within commercial premises.